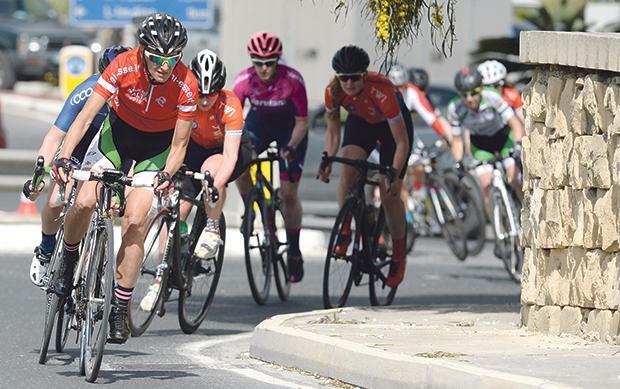 The third stage of The Cyclist Tour Ta’ Malta took off at the Żebbuġ By Pass yesterday, with a variety of interesting attacks and strategies in all categories. Two Maltese cyclists, both hailing from the sponsor’s team The Cyclist, claimed two coveted places on the podium. Maurice Formosa, racing in the Elite Category put up a good fight against Declan Reece (Stuart Hall Cycling Gett Taxi Bottechia) and members of his team. In the fifth lap Formosa and Jason Vella (Agones SFC) managed to get into the peloton and kept collaborating together. Riding with determination until the very end, a few seconds separated Formosa from reaching Reece. His attempts enabled him to take second place on the podium. In third place finished Declan Hudson. A good performance from Maltese cyclist Jason Vella earned him a positive finish as he placed fourth. In the Masters Category, Dave Mitchinson climbed from Friday’s third place to first followed by Colin Sturgess (Kuoat GSG) and Derek Barbara (Gibraltar). Etienne Bonello, who was clinging to fourth place in the previous stages, slipped down a place by just milliseconds. The Ladies Category saw Samatha Fawcett move to first place. Team-mate Sian Bottely maintained her second place from Friday whilst Madeleine Scott dropped down two places. Malta’s Marie Claire Aquilina had to settle for ninth place as she and two other crossed the finish line very much at the same time. It was joy for young Luke Borg (The Cyclist) who once again took top billing in the Junior Category. He was followed by Gianluca Camilleri (Birkirkara St. Joseph Sports Club), who made up for Friday’s disappointment on missing the podium. Sean Enriquez (Mosta AF Sign Studio) completed the trio. The last stage of The Cyclist Tour Ta’ Malta will take place today at 10:00am on the San Martin circuit. Road Closures will be in place so motorists are advised caution.